Here’s something we’ve never seen before: a structure made entirely of pants! 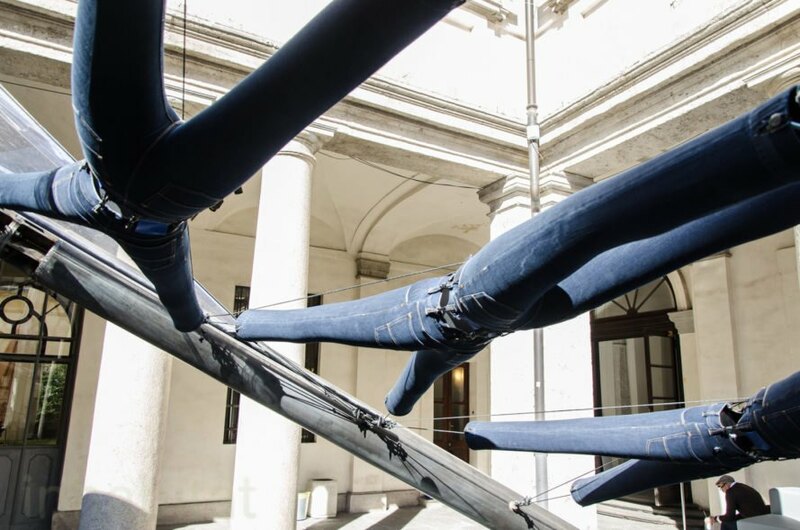 Starchitects Diller Scofidio+ Renfro just unveiled a sprawling pavilion made from 300 pairs of blue jeans in Milan. The installation is called Linking Minds, and it re-interprets the idea of using ready-made modules (in this case pants) in architecture. 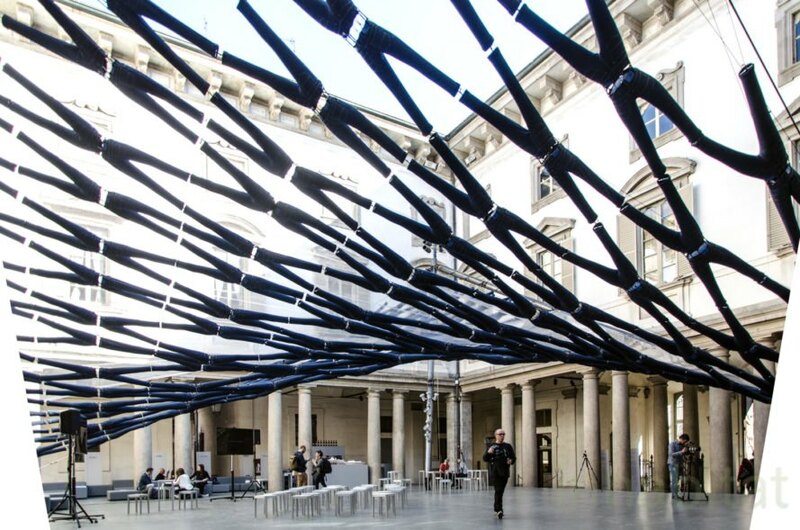 The surreal jean canopy soars over the historic Palazzo Litta in Milan. While the individual pairs of pants represent the human scale of urban life, the meshed twisted structure points to a sense of community and the collective nature of architecture. Liz Diller engaged with the historical Palazzo Litta in 5VIE during Milan Design Week 2017 to reinterpret one of the most basic architectural elements: the roof. Formally, Diller’s suspended structure resembles the 3D-printed twisted mesh typically used for festivals. However, in this case the structure is realized with an unexpected, simple but iconic material: denim. Jeans are one of the most ubiquitous garments around the world, however they’re also very private and intimate items that we wear in direct contact with our skin. Jeans are also a curious object in terms of structure. Having two legs and one waist, it has an implicit structural logic that allows various combinations and spatial patterns. Connected waist-to-waist and cuff-to-cuff, and filled with air, the Linking Minds installation is a visually dynamic work of art and architecture that is one of the main landmarks of Milan Design Week 2017. Linking Minds is an installation by the famous New York-based office Diller Scofidio+ Renfro out of 300 pairs of jeans that re-interprets the idea of using ready-made modules (in this case literally trousers) in architecture. 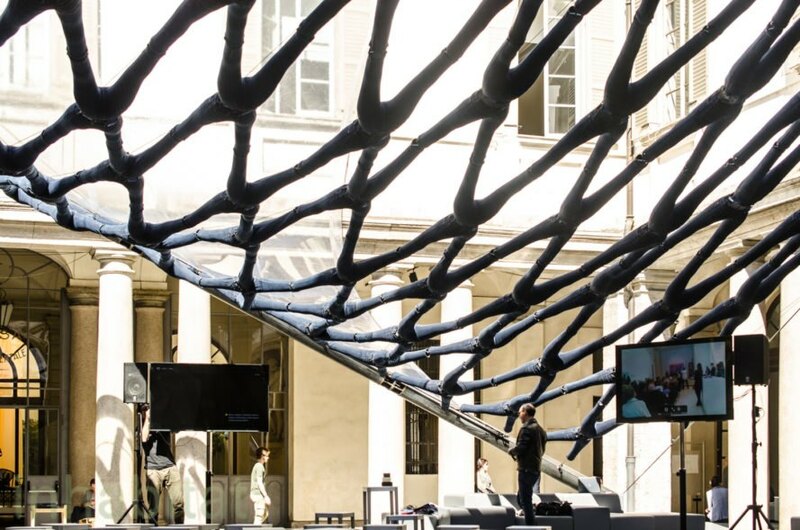 The jeans canopy over the historic Palazzo Litta, representing and reflecting the different scales of architectural projects. 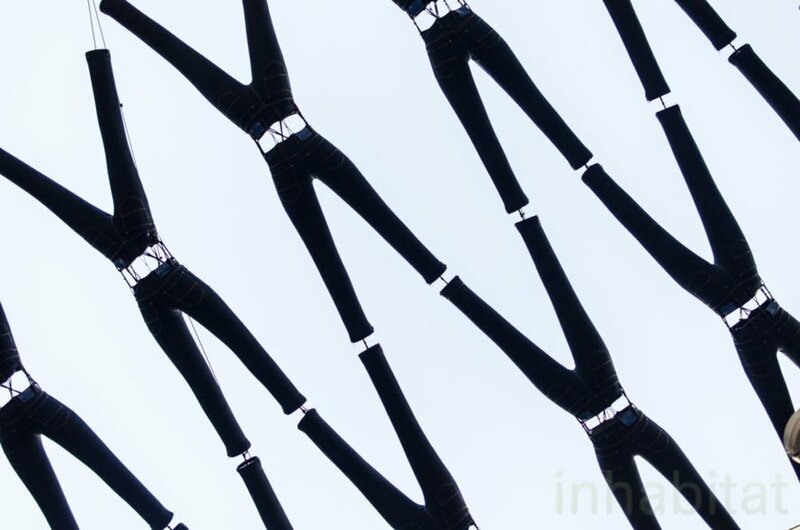 While the individual pairs of pants represent the human scale of urban life, the meshed twisted structure points to a sense of community and a collective architecture. Liz Diller, responsible for the project, engaged with the historical Palazzo Litta in 5VIE design district at Fuorisalone 2017 during Milan Design Week 2017 to realize one of the most basic architectural elements: the roof. 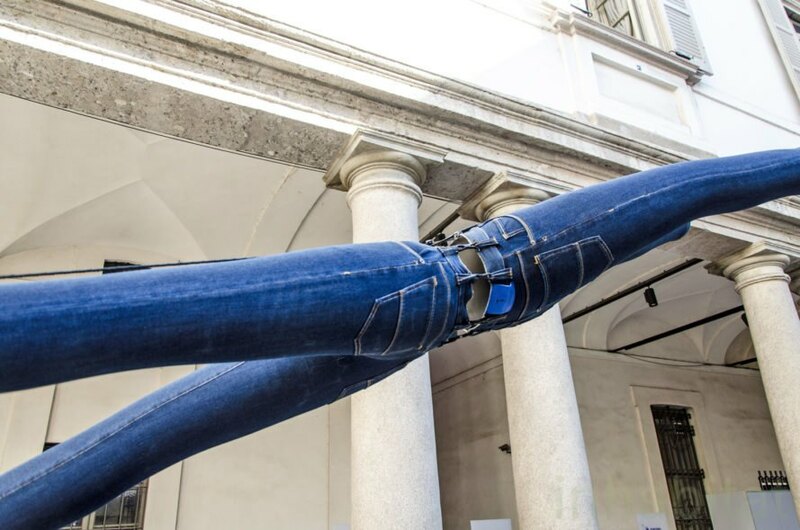 At Palazzo Litta, the roof is realized with one of the most unexpected, simple but also iconic materials: jeans. Jeans represent perhaps the best known and most widely used type of garment, which at the same time stands also for a very private and intimate piece that we wear in direct contact with our skin. Formally, this suspended structure resembles a 3D printed twisted mesh typically used for festivals. Jeans are also a curious object in terms of structure. Having two legs and one waist, it has an implicit structural logic that allows various combinations and spatial patterns. 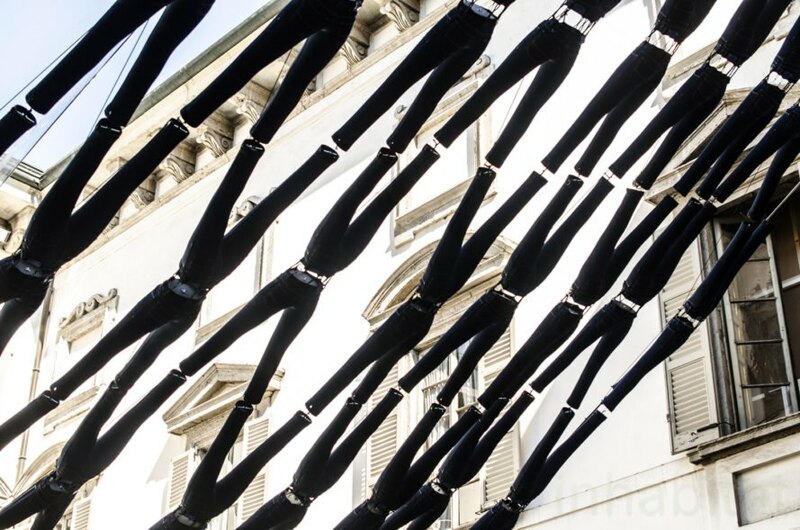 Connected waist-to-waist and cuff-to-cuff, and used as a pneumatic element filled with air, the Linking Minds installation is a visually dynamic work of art and architecture that is about to become one of the main landmarks of the Milan Design Week 2017. The roof covers the historic Palazzo Litta in Milan. A familiar and iconic product is turned into something new and unusual. Diller Scofidio + Renfro jean roof in Milan. The unusual roof is featured at Milan Design Week 2017. Linking Minds by Diller Scofidio + Renfro. A close-up of the Linking Minds exhibit by Diller Scofidio + Renfro. Linking Minds exhibit by Diller Scofidio + Renfro at Milan Design Week 2017.